Instead, the 18-year-old singer-songwriter chose to share a defining moment from one of those tough, soul-searching times that most teenagers eventually face—a time when she had to decide what really mattered in her life. It happened during the summer of 2008, a season of excitement, uncertainty and change before her freshman year at Roncalli High School in Indianapolis. For most of her years at St. Barnabas School in Indianapolis, Francesca didn’t have many friends. She often considered herself as “weird” to her classmates and viewed herself as “shy,” “awkward” and “not good enough.” But that perception began to change in her eighth-grade year when she wrote a song called “We Are” that became her class’ theme song. People began to see her in a different light. She found confidence and new friends. Soon, she also found herself facing a choice. Then Francesca sat at the piano in the church and sang the song in the same way that she encouraged the children to live their lives—sharing from the heart and staying focused on God. Why is the world so caught up in all this vanity? Oh, Lord, just help me be who I want to be. Everyone who knows Francesca says she has always wanted to be involved in music. Her mother, Chris, says that her daughter could literally sing before she could talk. Francesca started to play the piano when she was 4. By the third grade, she was singing at Masses at St. Barnabas Church with her father, Dr. Joseph LaRosa. She also began filling notebooks with song lyrics. And she had completed her first professionally produced CD of her music by her freshman year at Roncalli. 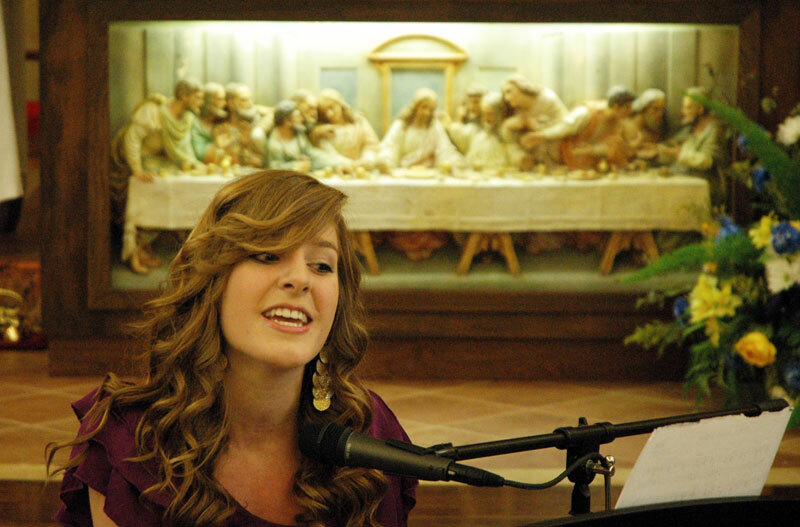 She also was chosen recently to sing the ballad version of “Called to Glory”—the theme song for the 2011 National Catholic Youth Conference in Indianapolis on Nov. 17-19. Her selection also thrills Kay Scoville, the archdiocese’s director of youth ministry. That’s also the reason why Francesca was recently invited to sing and speak at St. Roch Parish by its pastor, Father James Wilmoth. As the chaplain of Roncalli High School, Father Wilmoth has come to know the combined gifts of faith and music that Francesca adds to the choral groups and the liturgies at the school. That kind of praise is important to all people, and especially more so to teenagers who are trying to find friends and seek a purpose that will help give them a sense of belonging and direction in their lives. Even with her recognition as a singer, Francesca still regards herself as a typical teenager who likes swimming, watching movies, having fun with her friends and listening to the music of her idol, Taylor Swift. “I don’t just write songs about God. I write songs about boys and other parts of my life,” the Roncalli senior says with a shy smile. Even with her talent, she still connects with children and youths who doubt themselves. She smiles before adding, “I really hope that kids can believe that they’re really good enough, that they can believe in themselves, and that their dreams can come true.